SONOMA, Calif. – Over the past few years, the Sonoma Stompers Professional Baseball Club’s annual pilgrimage to Palm Springs, Calif. to scout the California Winter League has netted some nice returns. In 2014 the team used the scouting trip to sign the man who would make the first start in franchise history, Will Scott, and acquired two-year starter, Eric Schwieger. The following year saw Palm Springs produce second baseman Yuki Yasuda, as well as the man who would become the team’s eventual manager, Takashi Miyoshi. Though the results of this spring’s harvest have yet to bear fruit, the club is excited about the signing of four young hopefuls. Catcher Marcus Blackmon Jr., left-handed pitcher Landon Hunt, utility player Masahiro Miyadera, and outfielder Ethan Szabo all agreed to terms with the Stompers. “It’s a delicate balance, building a roster at this level, and at this time of year,” said Stompers GM Theo Fightmaster. “We spent a lot of time watching these players, speaking with scouts and coaches who have seen them play even more than we had, and spent time with these young men in an effort to teach them about the Stompers, Sonoma, and gauge what kind of people they are. Blackmon Jr, is a right-handed hitting catcher and graduate of the University of Jamestown in North Dakota. The 6-foot-1, 180-pound Oregon native received was a 2015 First-Team All-Conference player in the North Star Athletic Association (NAIA), and also earned was the recipient of the conference’s Gold Glove for catcher. During his college career, he threw out 57-percent of would-be base stealers. In the CWL, Blackmon hit .379 (11 for 29), drove in eight runs, scored seven times for the Toronto Rush, earning him rave reviews from Los Angeles Dodger Special Assignment Scout, Barry Moss, as well as Jamestown head coach Tom Hager. Hunt, 24, a 6-foot tall, left-handed hurler, is a product of Long Beach State University (the Alma mater of former Stompers Matt Hibbert and Brennan Metzger). With the Dirtbags, Hunt was used primarily as a lefty specialist, and in 2012 he didn’t allow a hit in his final four appearances. In 13 1/3 innings in Palm Springs, Hunt was 1-1 with a 1.58 ERA. In three starts he struck out 23 batters, and walked just four. Opponents in the CWL hit just .216 against him and he furnished a WHIP (walks plus hits per innings pitched) of 1.13. Miyadera played for Miyoshi’s club in the CWL, and has enjoyed stints in the CanAm League (Trois Rivieres Aigles) as well as professionally in Japan. In 29 at-bats in the CWL, Myadera had 12 hits (.353) with four walks, three doubles, eight runs and three steals while playing all over the field. Szabo – 6-foot-2, 230 pounds – is a resident of Delaware and product of Glenville State in West Virginia. He started 38 games in 2014, with a .278 average and a dozen extra-base hits, and an on-base percentage of .333. Last summer, Szabo played in the short-lived Ozarks Baseball League, where he was a two-way player (pitcher and outfield). He is following in his father’s footsteps in an athletic sense. Gerry Szabo was drafted by the Dallas Cowboys and has spent more than 40 years coaching and teaching. The Stompers open the season May 31, 2016, and start their home season in Sonoma on Tuesday, June 7, at 6 p.m. against the Vallejo Admirals. 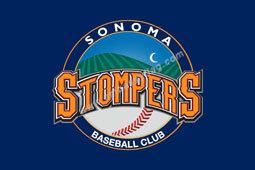 Full Season tickets, mini-plans and partial season tickets are on sale on our website, www.stompersbaseball.com, or at the Stompers Fan Shop, located at 234 West Napa Street in Sonoma. Group events and Group Tickets are also available now. Please email jack@stompersbaseball.com, or call 707.938.7277 for questions and more information.